I'm pretty sure if I had to pinpoint one thing I couldn't possibly survive without, it would be music (pffft who needs water and air anyway?) so with that thought I've decided to start introducing more music posts to my blog. I go to live shows quite often but one thing that's hindered me from blogging about them in the past is how difficult it is to photograph in most concert settings. The most obvious conundrum being that DSLR's usually aren't allowed to be brought into the venue (I guess this is a blessing in disguise as most of the gigs I attend involve rather brutal mosh pits that would most certainly translate to camera massacre) and with the addition of ever changing lights and constant movement on stage, I've always considered the outcome of iPhone or digital camera work rather un-blog-worthy. That said, live music has never been about trying to capture photographs, so I hope it's alright that I still share some of my music favourites here and who knows, you might find something you like. The music posts I've previously done can be found here. 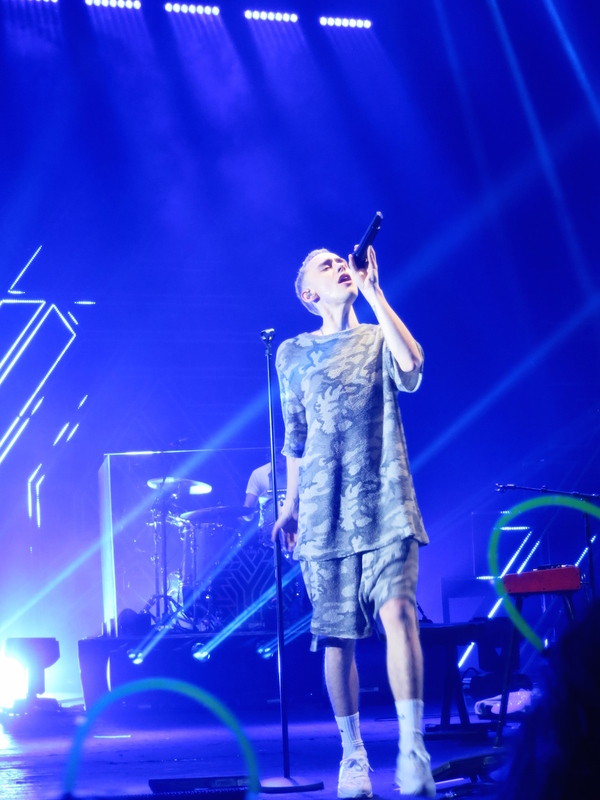 On to the gig at hand, Years & Years at Brixton Academy on the 28th October 2015. I absolutely adore this band and though I usually hate those seemingly pretentious knobs who insist they liked something before it was deemed cool, this time it's the case for me. I've been listening to the band quite a while before they were signed as I discovered lead singer Olly Alexander, who is also an actor, when he did theatre along side Ben Whishaw in 2013 (there are probably some hilarious fetus photos of us floating around my instagram if you care to dig). There's something magical and irreplicable about Olly's singing voice even though the band's music has changed somewhat from their indie beginnings. Their genre of music is now deemed as 'electro-pop' but I think that is a rather poor attempt to pigeonhole and really you should just give them a listen. Though I'm sure many of you know them already, as their rapid success has been quite astonishing but of course I think they deserve every ounce of it. Brixton Academy is a venue I'd never been in before but I really liked it. The standing area is on a gradual incline (much like a cinema but without seats) which means you get a good vantage point almost anywhere you are positioned. The interior design is a little perplexing I must admit, there are statues and pillars and tree sculptures (?) along the walls which immediately evoked Greece in my mind. My friend and I spent much of the gig deliberating what the architect was thinking but hey, I guess it looks cool whatever the reason. The first opening act, BØRNS, took to the stage in an eye-catching matching jacket and flares ensemble that could have been crafted from his grandmother's curtains. Outfit ogling aside, I fell in love with his first song and the six (?) other songs after that and had the firm intention of downloading all his music as soon as I got back home. Gosh, a decent support act is hard to come by and BØRNS blew my expectations out of the water. The second support act was Shamir whose bubbly personality and upbeat songs had the crowd moving and shaking but failed to entertain me. I just couldn't get into his music unfortunately. Well you win some and you lose some. It was well past 9.15pm before Y&Y took to the stage, unveiling a pretty impressive flashing backdrop that had not been part of their stage set up the last time I saw them at Heaven. Olly is a pretty tiny human being and having previously seen them play smaller venues, I couldn't help but wonder how he would command a stage this big. I really shouldn't have questioned it. Dressed in his signature oversized matching top and shorts that are much too reminiscent of a basketball player, Olly is as usual a force to be reckoned with, both charismatic and full of child-like energy, maintaining that angelic voice in between his signature dance moves that have now surpassed cringeworthy to endearing. It's probably worth it to attend a Y&Y gig for Olly's dancing alone. Flanked by his band mates, keyboardist Emre and guitarist Mikey, the trio power through a setlist that was basically the entire Communion album. During Shine, Olly launches himself into the screaming crowd, touching hands and even pausing for selfies whilst singing, all whilst sporting the biggest grin on his face. I think it's the happiest I saw him throughout the entire night. Upbeat songs such as Ties and Desire showcased some pretty impressive laser and light effects whilst Memo and Eyes Shut saw him sit down at his keyboard and simply allowed his smooth vocals to take centre stage (this is always my favourite part of the show). Towards the end of the night, Olly blurts out some of his bewilderment and gratitude at the fact that they had gone from playing 250 people to 5000 people in less than a year, before returning to the stage with King as their encore, a glitsy army of drag queens joining the explosive finale. That's so cute about him going to hug you what a sweetie! I really enjoyed seeing Years and Years at T in the Park festival. Great review! Awwww, he's so adorable! Sounds like a great gig.